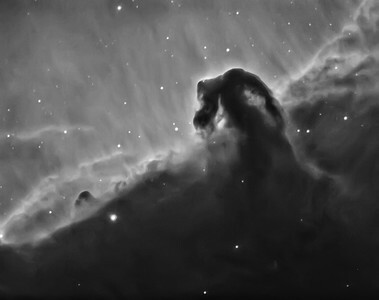 Captured this image of the Horsehead Nebula IC434 last night, during the same session as my NGC891 effort. This was started around 2am, and doesn't represent a lot of data. It was pretty cold, and I gave up after 10 subs. Used my Celestron EdgeHD11 with a Celestron 0.7x Focal Reducer, on my Atlas AZ/EQ-G mount. Effective focal length 1960mm at f/7. Guiding was accomplished using an Orion TOAG (off access guider), with a Starlight Xpress Lodestar X2 camera. Capturing camera was a Atik 460ex mono actively cooled CCD camera. Narrowband filter used was an Astrodon 3nm H-Alpha type. Captured 10x10min subs. Total integration time 1hr40min. No Bias or Flats were used. Post-Processing done with PixInsight and PS6.